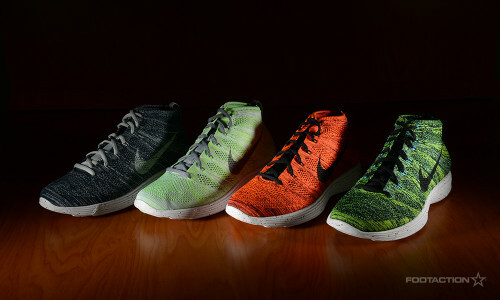 The Nike Flyknit Chukka isn’t going anywhere in 2014. The sneaker embodies the deadly combination of a bold look paired with comfort for the upcoming spring season. This time around, the Nike sneaker fuses the look of a mid-top chukka with lightweight Flyknit construction on top of a proprietary Lunarlon sole. The silhouette has arrived in four different colorways: Grey/Green/White, Green/Black/Volt, Blue/Platinum/Obsidian and Crimson/Black/Orange. Check out the pictures in the slideshow for images of each of the kicks. Available in select stores now. Print article This entry was posted by hhcblog on March 2, 2014 at 4:25 pm, and is filed under Footwear. Follow any responses to this post through RSS 2.0. You can leave a response or trackback from your own site.